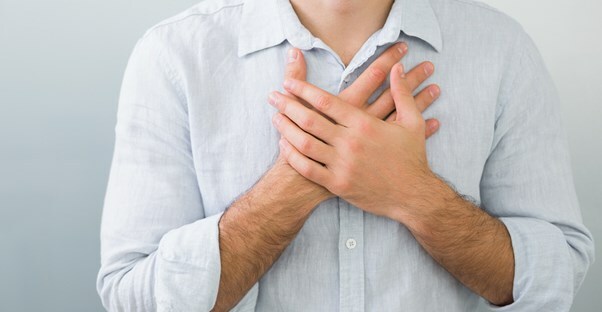 Chest pains are a not uncommon condition among many people, particular older ones. This type of pain is felt as discomfort or pain which can be located anywhere along the front of your body between your upper abdomen and neck. Many people who experience chest pains fear an impending heart attack. However, there are numerous possible causes of the pain- many have nothing at all to do with the heart. Some are not dangerous at all, while others can be serious, even life-threatening. Virtually any organ located in your chest could be the pain source, including your lungs, heart, esophagus, ribs, muscles, tendons, or nerves. The pain may spread from your chest to the back, abdomen, or neck. One type of chest pain is angina. It occurs when your heart is not getting enough oxygen and blood. A common symptom of angina is chest pains behind the breast bone or somewhat to the left of it. It may be felt as tightness, squeezing, heavy pressure, or crushing pain. The pain may also spread to the shoulder, arm, jaw, or back. The pain of a heart attack may be similar to the pain of angina, only more severe. Infection or inflammation of the heart may also cause pain near the center of the chest. Chest pains come in different forms, depending upon the underlying condition causing the pain. Chest pain symptoms can range from a dull, pounding ache to stabbing pain. Heart attack pain is more severe. A heart attack can be felt as a stabbing or crushing pain in the chest. A lung blood clot can cause chest pain symptoms This condition is known as a pulmonary embolism. A small section of the lung can collapse, resulting in pain. Pleurisy, inflammation of the lining of the lung, can create chest pain symptoms that typically feel sharp, and sometimes worsen when you cough or take a deep breath. The pain of shingles can sometimes seem to come from the area of the heart. Shingles is a viral infection of the nerves which can cause intense pain that radiates out from the chest to the back. Common heartburn is sometimes mistaken for chest pain symptoms. This condition is causing by stomach acid coming back up from the stomach into the esophagus or throat. One other possibility is a stomach ulcer. This type of pain is felt as a burning pain that improves after eating food. The pain could also be coming from the gallbladder. This type of pain often worsens after a meal, especially a fatty one. If the chest pain symptomsare severe enough, they may require medical care. Your doctor will want to examine you immediately if he suspects something like a heart attack, for example. Treatment for a heart attack should begin right away, even before a diagnosis. Give the victim an aspirin. Aspirin will thin their blood, making the heart's workload easier. If the aspirin has a coating on its surface to improve digestion, have them chew it before swallowing. One possible cause of chest pains is a collapsed lung or spontaneous pneumothorax. This condition occurs when the pressure balance between the outside air and the sac containing the lung is disrupted. The most common cause is an injury piercing the lung sac. It can happen through trauma such as a car wreck, gunshot wound, stabbing, or even in surgery. Problems with the diaphragm can also be felt as chest pains. Any damage to the diaphragm, or even below the diaphragm, can create pain in the chest.